Whether traveling for a luxury vacation or business, our Azerbaijan jet charter brokers can arrange a private flight to/from anywhere in Azerbaijan and neighboring areas. Travel to Europe using our Azerbaijan private jet charter service and arrive in style. Azerbaijan, also known officially as the Republic of Azerbaijan, is a country located between Eastern Europe and Western Asia. While there are many travel destinations within the country, most of our clientele visit and reside in the Capital City of Baku during their stay. The ideal times to visit Baku is during Spring (May) or Fall (September) when the weather is more relaxing. 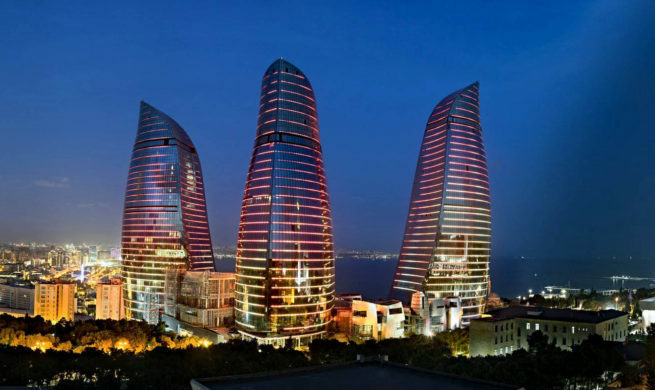 There are many five star luxury hotels in Baku for vacations, business travel, and special events. The below list of luxury Baku hotels are based on Jet Charter Europe clientele feedback, location, amenities, and online reviews. Choose from one of Baku’s many luxury options. Jet Charter Europe can also arrange luxury ground transportation to/from the hotel of your choice. Experience historic and religious sites, architecture, monuments, and cultural landmarks when visiting Baku. Jet Charter Europe clientele have mentioned the Old City Baku as the perfect leisure activity for a relaxing day in Baku. Visit the Old City and dine in one of the local restaurants to truly experience the Azerbaijan culture. The museum of Miniature Books is another unique attraction in the area worth visiting. This Baku museum consists of more than 6,500 books from 64 different countries. The city of Baku provides many activities for tourists, so make sure to research all local options before booking your next trip. Overlooking the ocean, Baku Boulevard gives a pleasant view while taking a stroll. Not only that, but there are many sculptures, restaurants, amusement park rides, really everything to turn a single visit into a day of entertainment. The cobbled streets of Old City Baku are like a step back into the past. With authentic buildings and winding streets, it’s easy to become immersed in the old city. Baku’s iconic feature, these three towers stand at a height of 190m, and can be seen from nearly anywhere in the city. During the day, they are spectacular pieces of architecture with shimmering reflections. By night, the 10,000 high-power LED luminaries light up with a laser display. Said to be a must by visitors and tourists alike, this 29.5m tall tower dates back to the 12th century. Inside is a museum which presents the historic evolution of the Baku city. In downtown Baku, there is a public square where many people gather. It is a very popular tourist attraction with many accommodations, but the main spectacles are the fountains and public art. Formerly known as “Kirov Park”, the Martyrs’ Lane is a cemetery and memorial dedicated the many killed in war and/or military conflicts. Many come to pay their respects, however tourists and visitors come for the architecture and the eternal flame. When was the last time you saw an enclosed city like those often viewed in medieval history or movies? There aren’t many of them around, but the Old City of Baku is one of the last standing locations that are actually an enclosed inner city. The city walls and their construction alone is a spectacle to be seen. For a truly one-of-a-kind attraction, the miniature book museum fits the bill. We’re not sure why anyone would have these unless they really love books and have a power magnifying glass. It’s one way to build a large collection and save a lot of space. Request a Quote or give us a call at 1-888-987-5387 to speak with one of our Azerbaijan private jet charter service brokers for your next luxury vacation, business trip, or special event.